It is generally felt by most historians, researchers and mariners that the tales and legends associated with the RMS Titanic were exhausted long ago and that nothing new can be said. However, a few mysteries do remain. Attempts to solve them have so far, defied researcher's hopes. One of these mysteries is the identity of several ships seen near the disaster site. Whilst a large flotilla of vessels did steam towards the stricken liner (Carpathia, Mount Temple, Virginian, Birma etc. ), or stay immobile, watching the nights events unfold (Californian), a few of the vessels are unknown. We know of them only by the testimony of people on the scene. A chart prepared for the US Hydrographic Department for the 1912 US Senate Inquiry into the loss of the Titanic. The actual wrecksite, and the lay of the icefield, are further east than depicted. Two of these ships were seen by Captain Moore, master of the Mount Temple, a vessel of 6661 tons, carrying over 1000 immigrants bound for St. John's, New Brunswick . At 12.30am on April 15th, 1912, she was at position 41o 25' North, 51o 15' West (or 51o 41' W according to a memorandum). Upon hearing Titanic's plea for assistance, Moore had the ship turned around and follow a course of N65E (True) towards the initial CQD position of 41o 44' N, 50o 24' W; a distance of 49 miles. At a speed of 11.5 knots, it would take over 4 hours to get there. He doubled his lookouts and set off. By 3am, the Mount Temple was encountering ice, and at 3.25am, whilst still about 14 miles away from the distress location, Moore stopped his vessel on account of the thickness of the ice, proceeding later on at a very slow speed. Before he stopped, shortly after 3am, Moore had seen a green light (that of a schooner travelling at a few knots, he thought), between him and his intended location. The Mount Temple's head was turned 2 points to port (to go "Green to Green") and the engines stopped, and then the other green light went out. The "schooner" was about a mile or a mile and a half away, Moore thought, in the direction that he was heading for; he even reported hearing the foghorn on the other ship. It has been suggested that the green light might have been one of the flares lit by Fourth Officer Boxhall of the Titanic, now drifting in a lifeboat. However, knowing that the wreck site is some 13 miles east of the "official" CQD position (41o 46' N, 50o 14' W), it means that the distance between him and the Mount Temple would have been over 20 miles away - well beyond the range of visibility. For more information on the Mount Temple, please visit this page. It is at this time that another ship, with slightly more in the way of identification, was noted by Moore. After turning to port, he noticed another ship - a tramp steamer on his port bow, going in the same direction as the Mount Temple. As Moore's ship proceeded, the other ship gradually passed her bows until she was on Moore's starboard side. The other ship was 4-5000 tons, perhaps a foreign ship (because "she did not show her ensign"). Moore attempted to signal the other ship with no luck, and noticed that the other ship was following him, perhaps looking for passage through an increasingly thick ice field, which he encountered at about 5am that morning. The other ship had a black funnel with a device in a white band near the top. Finally, at 4.30am, the Mount Temple was at the Titanic's distress location. He could immediately see that it was wrong, as there were no other ships apart from the tramp, and certainly no bodies or wreckage. From sun sights and from his sighting of the rescue ship Carpathia later that morning, Moore estimated that the Titanic had actually sunk about 8 miles to the Eastward of her reported position. She certainly could not have steamed through the huge ice field, 5-6 miles in width, dotted with hundreds of massive icebergs, and stretching north and south as far as he and his officers could see. Shortly after 6.00am, Moore noticed the infamous Californian to the north, steaming southward towards him. Third Officer Groves of the Californian noticed the Tramp too at about 7.00am, ahead of him at this time and a little on his port bow, but could make out no details because the other ship was head-on to him. He noticed the black funnel and that she was "small" , being considerably smaller than the Californian (at 6223 tons). Captain Lord, master of the Californian, noticed another ship close to the Mount Temple; this one had two masts and a pink funnel with a black top (the Leyland line colour, the same as his ship), heading between north and north-west. This ship was identified as the Almerian , out from Mobile. At 3am on 15th April, she was stopped on account of ice, and another steamer was in site on the port quarter. An attempt was made to communicate by morse lamp, but all the 2nd officer could discern was "...ount...". As Leslie Harrison, Captain Lord's proponent, "The Almerian was taken at various speeds in a northerly direction....the ship first seen at 3am [The Mount Temple] was now underway, apparently looking for a passage through the ice field". The Almerian, a ship that was not equipped with wireless, was running along the western edge of the icefield and saw a ship on the far side (Carpathia?) and then the Californian steaming from the north, and then turn east to rendezvous with the other ship. Finally, Almerian came close enough to read the Mount Temple's name, which turned onto a north-westerly course; Almerian continued north until 10am and managed to find an area of the icefield that was sufficiently diffuse to allow passage to Europe; she cleared the ice at 10.30am. Meanwhile, Captain Moore saw another ship, the Birma at 8.00am steaming very fast. 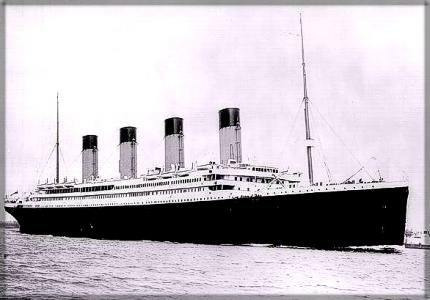 Initially mistaking her yellow funnel and mast for Olympic, Titanic's sister, he steered towards her. Incidentally, Moore makes no mention of identifying the Almerian. The stranger with the black and white funnel was visible to Moore until after 9am; but by mid morning, when other ships, such as the Frankfurt and the Birma had arrived at the wreck site, the stranger was nowhere to be seen. An attempt was made to ascertain the identity of this black funnelled ship during the British Board of Trade Inquiry; one inspector going so far as to surreptiously use a penknife. scrape the paint off the funnel of a ship he suspected had recently been repainted. An attempt at a solution was made by suggesting the SS Saturnia, a ship whose funnel matches the colour scheme of the mystery ship . The identification is based information provided by two passengers bound for Glasgow aboard the ship, who state that the ship was only 5 miles away from the Titanic and stopped on account of the ice. However, her master, Captain Taylor, proved that the ship was actually 350 miles west of the wreck site at the time of the disaster . The Saturnia, a 1 funnel, 2 masted ship, had a top speed of 14 knots, and docked in St John (New Brunswick) on April 17th, a distance of some 840 miles. At 14 knots it would have taken 2.5 days to traverse the distance from the wrecksite, which puts the date as being April 14th-15th depending on when she docked in St John. If we take this literally, then the Saturnia must have been off-course, as she would have to have been steaming north-west at this point. If we deduct 350 miles from 840, we get a distance of 490 miles left to travel, which the Saturnia would have to have covered from approximately midnight on April 15th, to her arrival some time on the 17th. Which yields an average speed of 8 knots, which is suspiciously low. The Saturnia was travelling westbound, which means that she would have encountered the eastern side of the icefield. Presumably, she would have had to steam around it. Captain Moore saw the black and white funnelled ship on the western side, and he presumed she was heading eat as she seemed to be trying to find a safe route through, or round the ice pack. The biggest problem with the Saturnia as a candidate is that she would be wildly off course. Following the customary route from Europe to Canada, she would traverse westward until she reached 42 N 47 W, then she would alter course to the north-west, towards St John. She would thus be wll to the north of the Titanic at the time of the accident. No other credible possibilities for this black/white funnelled ship have been suggested . Other possible mystery ships lie to the east of the icefield, the side that the Carpathia was approaching from, and the side in which the Californian lay stopped for the night. At 12.30am, the Carpathia started her dash to the north-west. By 3.00am, she noticed green flares in the distance, 1/2 point of his bow - flares fired by Boxhall. At the same time, Captain and his officers Rostron noticed two masthead lights and a red port light of a ship 2 points off this starboard bow. To reassure Titanic's passengers that help was on the way, he ordered rockets and Cunard company signals to be fired. At exactly this time, somewhere to the north of the wreck site, the Californian noticed rockets right on the horizon, at "such a distance that if it had been much further I should have seen no light at all," as Second Officer Stone said later. Three rockets were seen, separated by a few minutes. Apprentice Gibson, standing beside him, saw nothing of the ship firing these rockets either. It has been suggested that the Californian, heading roughly west saw Carpathia's rockets (which is plausible) and the Carpathia saw the Californian's red sidelight. If the Californian was only ten miles north of the Titanic, it meant that the distance between the two ships would be about 17 miles - theoretically, within viewing distance of each other; however, the lights would be right on the edge of the visible horizon. It does seem odd that two ships looking at each other should see different things. Also, although most witnesses on the Titanic reported seeing the lights of a ship off the port bow (that is, to the North), one witness did report seeing a red and a white light on the starboard beam - roughly in the direction that the Carpathia saw "her" red lights. One must also consider Quatermaster Rowe. As recounted in , Rowe was convinced he saw a ship's light on the Titanic's starboard quarter after 1.00am ships time. Although Captain Smith thought that it was a planet, astronomical programmes show that the only visible planet in the sky was Jupiter. It was, however, sufficiently high in the sky for it to have been impossible to have been mistaken for a ship's light on the horizon. Rowe was sure that the light he saw was a ship's light. 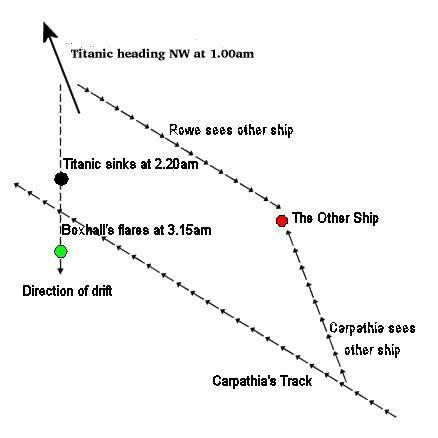 At this time, the Carpathia was too far away to have been responsible for this light, even though the bearings to the Titanic are extremely similar. The situation is summarised in the diagram below. The situation in the early hours of April 15th, 1912. On the Carpathia, the red lights of the ship were seen at roughly the time that Boxhall's flares were seen (at 3.15am, with about ten miles to go to the wreck site). If we assume that the red light came from the Californian, and that the Californian-Carpathia distance was barely sufficient for the two ships to see eather, then we have the Californian being roughly 7 miles from Boxhall, at a bearing of approximately N60E. 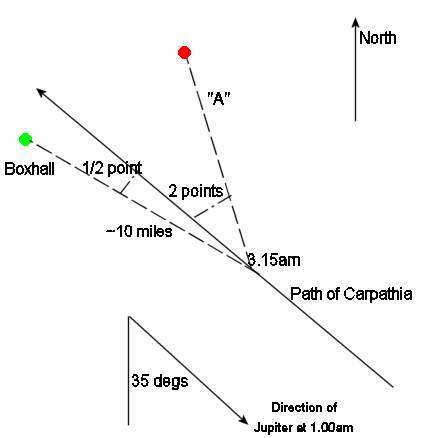 If the Titanic was pointing roughly North, and a Carpathia-"red light" distance ("A" on the map) was less than the maximum value above, then this would put the unknown red light ship much closer to the Carpathia's track - i.e. further to the south and east. Thus, this red light ship could correspond to Rowe's observation of a light on the Titanic's starboard quarter (i.e. right rear). If this is right, then this would indicate that this mystery ship was in the vicinity, unmoving, during the sinking. Admittedly, this does rely on the above sequence of events being correct, but it would mean that, after 1.00am, Rowe saw his ship's light. At 3.15am, Rostron sees the red light of (perhaps!) this same ship, in very roughly the same location as Rowe. From this data, it looks as if, for over 2 hours, this other ship did not move. If the above assumptions are true that is. In the aftermath of the sinking, Captain Rostron noticed two ships to the north of the rescue operation . Both had one funnel; one having four masts, and one having two masts. The former was dodging about in the ice, and the second was coming west to east "straight on his course". Although, at the time, he stated that neither of these was the Californian, he later changed his mind . I am not sure that the other ship has ever been adequately identified, although Leslie Harrison suggests that the Almerian is one of them. Also, as day broke (4.00am), the officers on the Californian saw a one funneled, four masted ship "with lots of lights amidships" to the south - in the direction where a ship had been seen firing rockets (The Titanic?). Chief Officer Stewart didn't identify her, but noted that the funnel was yellow - the same as the Mount Temple's. This ship has never been identified either, although it may have been the Carpathia, the rising sun making the funnel colour appear brighter than it was (Cunard funnels being red and black). However, none of the other ships noticer - perhaps she was too far north- but she was seemingly on the same side (east) of the icefield as the Californian. The Mount Temple was to the west. Whatever the other ship's names, and their purpose, it is highly doubtful that they could have played any part in the rescue operation; however, their identities are still unknown and deserving of further research to perhaps close the book on these navigational mysteries; after all, regardless of what they could or could not have done, they were witnesses and might have seen something unknown to the present day. According to Lloyd's List of April 15th, 1912, "at least one full rigged ship and one fishing smack are imprisoned in the floes". Their identities are not known. - Testimony of Captain Moore of the Mount Temple taken from the British and US Inquiries; testimony from the crew of the Californian (Groves, Stewart, Stone and Gibson) and Captain Rostron of the Carpathia taken from the British Inquiry. - Saturnia - "Titanic: Triumph and Tragedy" by John P.Eaton and Charles A.Haas, Patrick Stephens, 1986, p.174. - Trautenfels and Lindenfels have also been suggested. Both these ships, petroleum carriers belonging to the Hansa Line in Bremen, had black funnels with a white band, around which were red hoops; the Lindenfels also had a Maltese cross in the middle of the white band. Both ships lacked wireless and had one funnel and two masts. See "A Ship Accused - The Case of the S.S. Californian Re-Examined" by Senan Molony, Cedric Information Services Ltd., 2003, p.224-5. Howver, George Behe notes the following on these ships: "Trautenfels: At 8 a.m. on April 14th the Trautenfels was already west of long. 50o W. Captain Huper said his vessel was 100 miles southwest of the Titanic by the time the disaster took place. Lindenfels: The sole reference to this vessel I've been able to find was in a letter from the Treasury Dept. to the Commissioner of Navigation that was quoted in the Senate Inquiry: "The 'Trautenfels' of that line arrived at this port [Boston] early in the morning on 18th April, and the 'Lindenfels' on 20th April. As I am informed that the voyage from the locality mentioned by the Bureau to this port is from three to five days, according to the speed of the steamer, the 'Trautenfels' would probably not have been in that locality on 15th April." April 14th, 5.40am in lat 42 01 long 49 53 sighted two icebergs fully 200 feet long and 50 feet high: soon after heavy field ice was encountered which extended for a distance of 30 miles and made it necessary for the steamer to run in a south-westerly direction for 25 miles to clear it; in the field ice Captain Huper counted 30 bergs, some of which were very large; off to the southward no clear water was seen, so that the captain estimated that the ice in that direction must have extended fully 30 miles. Obviously, by the time the Titanic struck, Trautenfels was not in the vicnity. - for information on Rowe's "Planet" sighting, look here and here. For a night sky simulation programme, look here.